Create your winter wonderland with our gorgeous Faux Snow. Dust over your decorations or shower them for an authentic snow look. Use with Designer Dries Clear adhesive glue for an ice effect or you can use Designer Dries White glue for a snowy appearance. 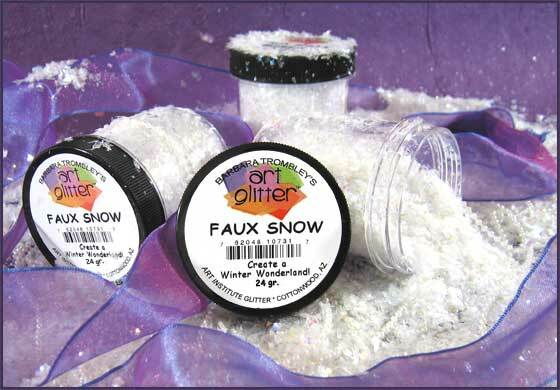 Used alone, you can use it as a beautiful bed of soft glitter flakes. This item is sold by the jar. One 4 oz. jar contains 24 grams of glitter. 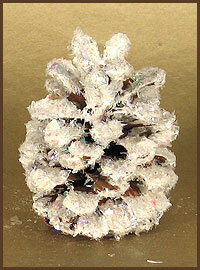 The frosty pinecone shown below was made with Faux Snow and Designer Dries White adhesive.